I have quite a lot to update you on. Since my last post I have been all over the place. I have climbed in Yorkshire, The Lakes, Wales and Stirlingshire. I went down to Yorkshire on the 7th and took Anne Peale with me. She has no exams as she is a masters student and was psyched to climb. On Wednesday we went to Almscliff. Here I led Z Climb (VS) and Dolphinian (E1). I also did a bit of bouldering. I got quite close to Teaspoon Variation (font 7b-ish) and Si's Arete (font 7a). On both of these problems I can link up to doing the final move, which is a bit annoying. That evening we drove to The Lake District. We stayed with friends of mine, Pete Holder and Pete Hill. On Thursday we went to the newly re-bolted "The Works" near Coniston. 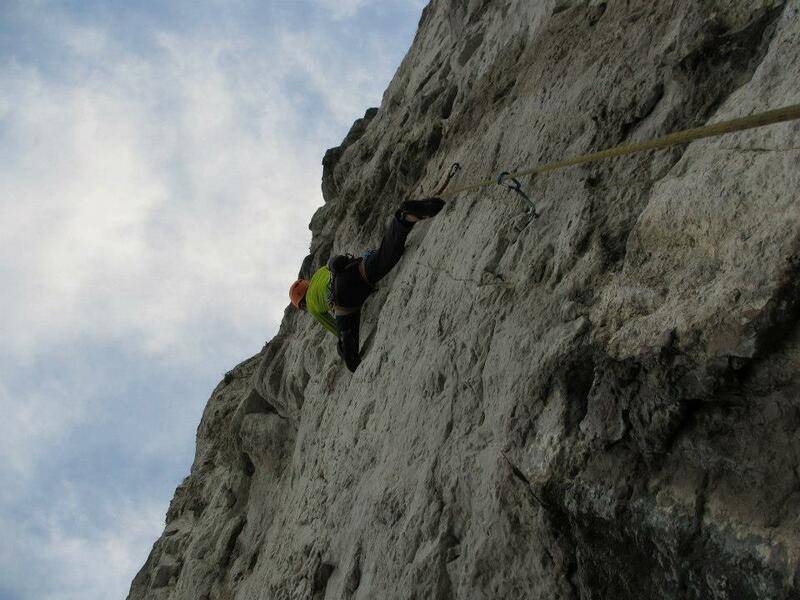 I climbed Stein Pull (M6), the only route on the industrial sector which I hadn't done before. I then belayed Anne and Pete (Hill) up it. The second cave at the works, just to the left of the main cave, now has a route bolted in it. It hadn't seen a first ascent but Pete thought the guy who bolted it would be fine with us trying it. Pete sent me up it so that I didn't blow the onsight by watching him. I managed to flash the route up to the end of the steepest section where I really struggled to get into the next hold. After falling off I managed to find a small intermediate which I could use to allow me to get my feet onto the left wall. I then managed to rip the stein pull on the last move before the lower off, but I managed to do it after getting back on again by being very careful. Next it was Pete's (Holder) turn but he fell off at the same place I did before climbing the last few moves to the lower off. I fell off again at the same place on my second attempt after not getting a good enough hook on the intermediate. Anne and Pete (Hill) also gave the route a go. 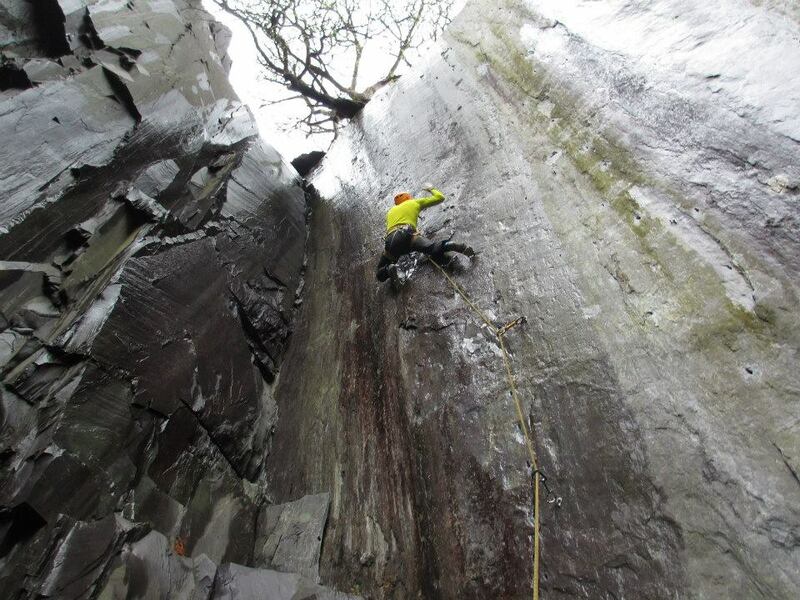 Pete (Holder) managed to climb the route clean on his second attempt of the day. He has called the route "Lakes Ethics" in reference to the recent bolt chopping and given it the grade M9+. I had one more go and managed to climb cleanly to the very last hold before my axe ripped through the very small thin stein pull. We all moved onto the second were Pete and I attempted Guardian of the Underworld (M12) and Anne and Pete (Hill) attempted Bloodline (M10). That evening, after a quick check of the weather, Anne and I decided to go down to Wales. Our plan was to climb in the slate quarries around Llanberis as they may just about be dry, and if not there is a small drytooling venue. The morning brought about a lot of rain so after a breakfast in Pete's Eats, and a look round V12 and Joe Browns, we went to the Dinorwig slate quarries to find the drytooling at Never Never Land. After getting a bit lost we finally found it. 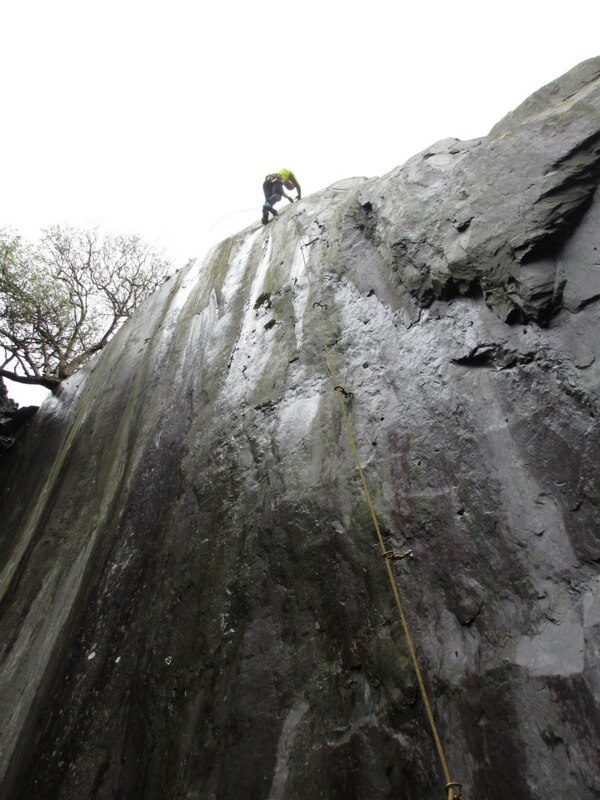 Everything was very wet and some lines resembled waterfalls but luckily others were reasonably dry. I warmed up on Monkey Bar Kid (M6+) before climbing The Deerhunter (M7) and the The Ibex Direct (M8). I thought The Deerhunter was particularly good with some fun stein pull moves at the top. I decided against trying the harder line of Bambi (M9+) as there was a huge runout at the top and I couldn't see any holds. I would really like to visit here again, hopefully with someone that has beta on the harder routes. I wonder if I could flash everything in the entire quarry? I met up with Helena Robinson in Pete's Eats for a drink. She recommended going to the Great Orme near Llanludlo on the way back to Yorkshire. 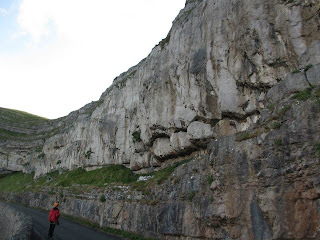 The Orme is a really cool place to climb with routes starting directly above the road, which you unfortunately have to pay a toll to drive on. I only completed one route, Firefly (E3), despite attempts on Captain Fingers (F7b) and Excursion Direct (F6c+). I backed off Excursion Direct as I didn't bring any nuts for the top of the route, which it shares with a trad route, and Captain Fingers felt quite hard. I took Saturday off to clean the car and drive back up to Edinburgh but I was back on it today with a trip to Wolfcrag Quarry and Cambusbarron, both near Stirling. I had wanted to climb sport, but it looked wet, and my second choice was tooling, but I couldn't find a partner. I climbed a number of boulder problems at Wolfcrag including Edges (font 6C+), Oval Pocket (font 6C) and Side Pull (font 6C+). I decided to see how dry Cambusbarron was on the way past. 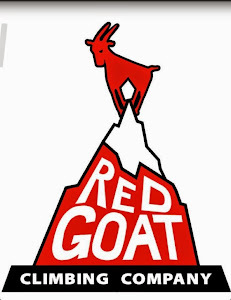 I climbed here last year and nearly on-sighted my first E4, but fell off thanks to loose rock whilst pulling onto the top of the crag. I was pleasantly surprised how dry it all was seeing as it was under the trees. 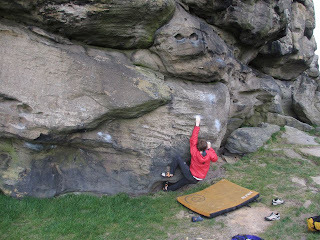 I had a go at Spanking the Monkey (font 7a). This problem takes a slabby arete on a very much featureless boulder. It requires pure friction climbing and unfortunately the moss of the boulder was still damp, despite the rock being dry, leading to me repeatedly falling off after the first couple of moves. This is definitely one to come back to though. I had a go at the left hand side of the arete of Spanking the Monkey, Monkey Spanking (font 7b). It felt very hard and I could barely get off the ground, but again one to come back to. I climbed a boulder problem called Treehugging (font 3) in my trainers on my way back to the car.